In what will most likely be my final visit to Which Wich? for the year, I went to redeem the loyalty punch card for my free sandwich. I had collected the necessary ten stamps from the purchase of ten sandwiches over the course of the last couple of months. I have to admit I love these kind of gimmick programs as I find the collection process of the program nearly as much fun as the redeeming aspect of the process. It’s almost like a mini-goals card, and each punch brings you one step closer to that free prize, in this case a sandwich. When you think about it, it’s really a good deal for the restaurants or other businesses that offer these kind of loyalty programs. In the case of Which Wich?, the value of a completed card is the price of a single sandwich, here in the San Diego area, that means a full card is worth $5.25. But in order to get that $5.25, a total of $52.50 needs to be spent. That’s just the bare minimum that must be spent, that doesn’t include the chips, cookies, or drinks people may buy in addition to the sandwiches. Which Wich? even takes it a step further and adding an end of the year deadline for the punches to be collected and redeemed. This card when full expires on December 31. Any unredeemed cards or ones that didn’t collect enough punches are voided and the whole process starts over on January 1. 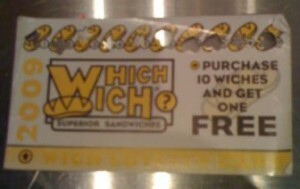 I would doubt most redeemed punch cards at the Which Wich? I went to redeem my card would feature punches from all four of the Which Wich? locations in California. The Santa Ana location near Disneyland has a “W” shaped punch. Carlsbad’s location offers a star shaped punch. The Pacific Beach location has a club or clover like punch, and the Hillcrest location has a heart shaped punch. My redeemed card featured two punches from Santa Ana, three from Carlsbad, one from Pacific Beach, and four from Hillcrest. Not bad for someone who lives about 20 miles from the nearest Which Wich? location. As I mentioned above, I love these kind of loyalty card programs. I have a background in Marketing so some of the things I think are brilliant about the program is the card needs to be kept in your wallet so that it’s conveniently available for your next visit. That means the store offering the card has their their logo sitting in your wallet and every time you see it, you are reminded that you have a reason to go visit the store. The purchaser also gets a sense that their purchase is working towards a free prize so it makes each purchase feel like a premium experience because it gets them one step closer to their goal. And again, as Which Wich? chose to make their cards expire at the end of the year, it helps create a sense of urgency to get the card completed before the year finishes. That way any people with just a few punches left may make additional visits specifically to add the last remaining punches they need before they can redeem the card. And the back of the card asks the user to fill out their contact information before they redeem the card so the store has the opportunity to get to know the names and addresses of their best customers. Great strategies all around. Probably the area where I think Which Wich? has been lacking is the follow through on the redeemed card. As I mentioned above, the card I was redeeming was my second card I had redeemed this year (considering I only learned about Which Wich? this summer and the distance to my nearest one makes it more of a special occasion to go.) I filled out the name, address, and e-Mail address blanks on my first card, but never heard anything from Which Wich? They’re missing out on a golden opportunity to build a relationship with their customers. If you think about it, they’re getting the contact information from people who’ve already purchased ten sandwiches from them, so it’s a good likelihood these folks like the sandwiches. If they were to send out an e-mail or postal mail piece to thank them for their business and maybe send them a coupon or something to enjoy on their next visit, they’d be making their customers feel appreciated and give them additional incentive to return to Which Wich? instead of their competitors. By contrast, Subway sandwich shops used to offer loyalty cards redeemable for free sandwiches. I can’t even tell you how many of those I’ve redeemed over the years, The cards initially had boxes for the employees to initial, then it eventually evolved into a stamps system, before Subway ultimately got rid of the program. I have to be honest, I quit going to Subway with any frequency after the loyalty cards disappeared. I think in all of 2009, I probably went to Subway three or four times. There are a lot of Subway shops near where I live, and yet I still managed to fill out two full loyalty cards for Which Wich?, when the closest Which Wich? is about 20 miles away and my nearest Subway is within 2 miles. It’s rather telling, isn’t it.